We are proud and delighted that our pony club received the Horse & Hound NAF Five Star Riding Club of the Year award in November 2017. 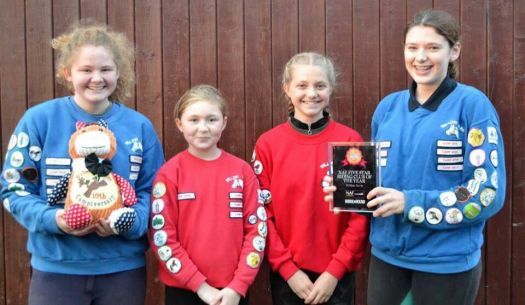 Our weekly Saturday Pony Club group study for various badges as well as welcoming outside speakers like PCSO Jayne Richardson who recently came to talk about security and tack marking – and let some of the members actually have a go at marking a saddle. We also have rally days for juniors and seniors in school holidays – sometimes quite exhausting for little ones but always challenging for the older members. Our Teams take part in Inter-Centre competitions with other Pony Clubs, as well as in Area and National Competitions within Pony Club as a whole. And not forgetting the Pony Club Camps! Summer Camp is the highlight of our year, and the 4 day Pony Party at New Year is so much fun for everyone. Whatever your interest there is something in a Pony Club for you. For more information ring Lora or Sue on 01754 830316 or contact us on Facebook.